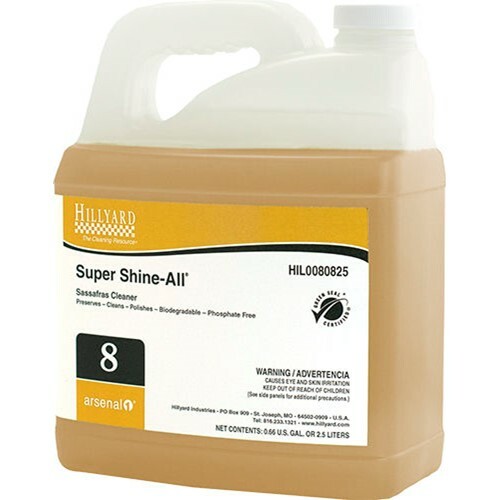 Home → Chemicals → Hillyard, Arsenal One, Super Shine-All #8, Dilution Control, HIL0080825, Four 2.5 liter bottles per case, sold as One 2.5 liter bottle. Concentrated, neutral pH formula won't harm your floor finish. Perfect for cleaning resilient tile, asphalt tile, vinyl floors, synthetic floors, terrazzo, quarry tile, paver brick, natural stone and coated wood floors. Protective sheen helps preserve and protect. Excellent choice for damp mopping and auto scrubbing. Biodegradable. Phosphate free.